Thirteen first division clubs across the Ancient County of Berbice recently received brush-cutters compliments of the Guyana Cricket Board (GCB) as part of developing their facilities. According to a GCB release, West Berbice, Upper Corentyne, Blairmont, Tucber Park, Rosehall Town, Police, Young Warriors, Edinburgh, Port Mourant, Albion, Skeldon Community Development Centre, Rose Hall Estate and Bush Lot, were recipients of the items which were donated by the GCB contingent consisting of President Drubahadur, Secretary Anand Sanasie, Marketing Manager Raj Singh and Territorial Development Officer (TDO) Colin Stuart. 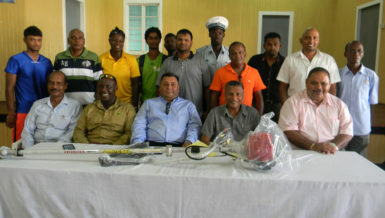 The GCB executives met with representatives of the clubs at the Albion Community Development Centre on Wednesday and presented the equipment. Drubahadur told the clubs that he was happy that they have striven to maintain the equipment so that the club grounds can have maximum utilization of them. Sanasie said the GCB recognized that cricket clubs need help preparing grounds, especially when the weather is bad. 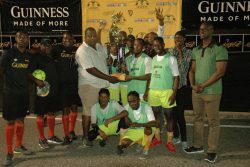 He stated that the GCB is reaching out to Berbice, a continuation from last year when the GCB assisted clubs in Berbice with cricket nets and cash. 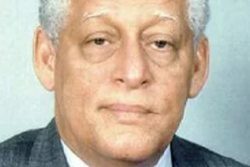 He added that the board would continue to help clubs in Guyana with regards to developing their facilities. 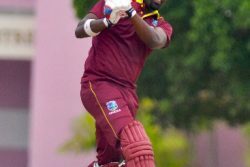 He called on the clubs to take good care of the brush-cutters and asked the Berbice Cricket Board (BCB) to check them from time to time. Angela Haniff, Secretary of the (BCB) thanked the GCB for this initiative, noting that the cutters would help a great deal in getting grounds prepared and ready for first division and other cricket in Berbice. She stated that BCB would take full responsibility of keeping the brush cutters in proper conditions.